Front 3/4 view of Formation 1. Flag ship HMCS Algonquin, HMCS St-Johns and HMCS Protecteur. HMCS ST-JOHNS is operating in and around the Gulf of Oman as part of Operation APOLLO, Canada's military contribution to the international campaign against terrorism. Vue trois-quarts avant de la formation 1. Le NCSM Algonquin, navire amiral, accompagné des NCSM St. Johns et Protecteur. Le NCSM St. Johns est affecté dans le golfe dOman et dans ses environs pour lopération Apollo, la participation militaire canadienne à la campagne internationale contre le terrorisme. VICTORIA, British Columbia – Canada has opened up its competition for new warships to designs still yet to be proven, despite its previous commitment to purchase only off-the-shelf vessels. The change will allow more domestic firms to participate in the multibillion-dollar acquisition of what is being called the Canadian Surface Combatant since a new design is not wedded to foreign systems. In addition, the change would provide Canada potentially with the most up-to-date technology. "You want to make sure that what you get on offer reflects not only what's tried and tested in the market but also what's coming on the market," explained Lisa Campbell, assistant deputy minister of acquisitions at Public Services and Procurement Canada, the department overseeing the procurement. Irving Shipbuilding Inc., of Halifax, the prime contractor for the project, released the request for proposals package to pre-qualified bidders on Oct. 27. Twelve firms, mainly European, have been pre-qualified as either ship designers or combat systems integrators. The Canadian government's decision to change criteria for the designs it accepts now allows BAE Systems to bid its Type 26 design for the surface combatant project. The United Kingdom is still negotiating with BAE on a timetable for construction of those vessels. Other shipbuilders had privately voiced concerns about the change in criteria, pointing out that earlier this year Canadian government officials stated an acceptable ship design was to have been completed and reviewed by the government purchasing the vessel. A proven design would cut the amount of technical risk and speed up the procurement process for Canada, Procurement Minister Judy Foote said at the time. Anne Healey, BAE's general manager for group business development in Canada, said because of competition rules she can't discuss the status of the Type 26 design and the UK program. But she noted that the Type 26 Global Combat Ship is "the world's newest and most advanced surface combatant design. We are planning to cut steel in 2017, which is ideal timing for the CSC programme; being 3 years ahead of the Canadian program." The companies pre-approved by Canada to submit a warship design for the CSC include: Alion Science and Technology Corporation; BAE Systems Surface Ships Limited; DCNS SA; Fincantieri S.p.A; Navantia SA; Odense Maritime Technology; and ThyssenKrupp Marine Systems GmbH. The firms pre-approved as combat system integrators include: Atlas Elektonik GmbH; DCNS SA; Lockheed Martin Canada; Leonardo S.p.A.; Saab Australia Pty; Thales Nederland B.V.; and ThyssenKrupp Marine Systems GmbH. The winning designer and combat systems integrator are to be selected sometime in the summer of 2017. Construction of the first ship will begin in the early 2020s. The first CSC is expected to be delivered in the mid-2020s. 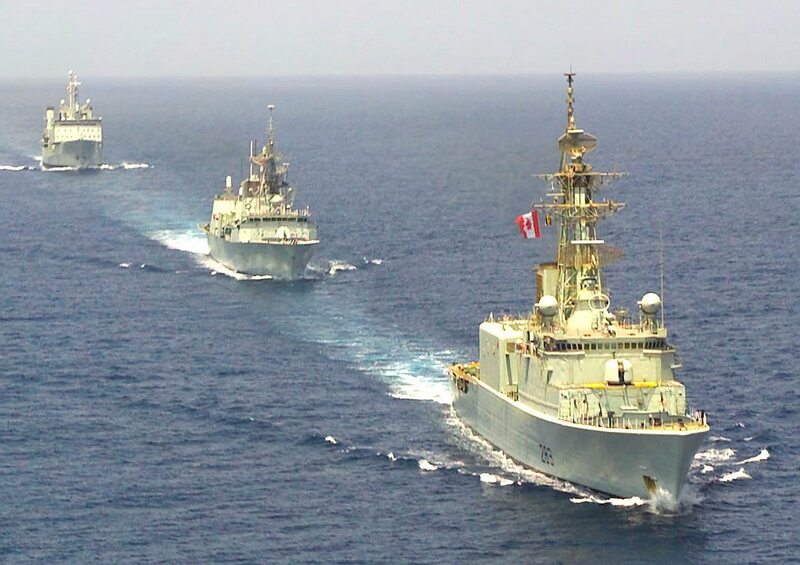 Up to 15 warships could be built, but Pat Finn, assistant deputy minister, materiel, at the Department of National Defence, noted the actual number of vessels still has to be decided. The budget for the CSC project was originally estimated at (CAN) $26 billion ($18 billion). But Department of National Defence analysts have projected the ships could eventually cost (CAN) $40 billion. More than half of the cost of the project will be for the on-board combat systems and the integration of those systems, industry officials say. The vessels will replace the Royal Canadian Navy's Iroquois-class destroyers and Halifax-class frigates. Public Services and Procurement Canada spokesman Nicolas Boucher said each bid would be evaluated by Irving Shipbuilding Inc. and the Canadian government. "Evaluation of the bids will include financial and technical performance, maturity of the design along with the economic benefits," he noted.